Airliners-India :: View topic - Is it time to merge RDG and UDAN? Posted: Tue May 22, 2018 11:06 am Post subject: Is it time to merge RDG and UDAN? Is it time to look beyond trading of ASK for RDG & merge UDAN & RDG in long term? Last few weeks have seen the media report the possibility of a tweak in the National Civil Aviation Policy (NCAP) to allow trading of Available Seat Kilometers (ASKs) between airlines to satisfy the mandatory requirement of Category II and Category IIA routes as defined in the Route Dispersal Guidelines (RDG). The permission to trade had been “inadvertently” left out from the new policy and something which was encouraged pre-2016 has completely stopped now. Do we require policy changes and is there a possibility or merging schemes to have a better offering for the airlines and customers which makes government schemes attractive and fulfils the governments objectives? The RDG came into effect for the first time in 1994 with an objective to connect the underserved or unconnected routes. The concept mandates airlines to deploy a minimum capacity on remote routes which are categorized as Category II and IIA along with a minimum capacity into metro to non-metro routes which is categorized as Category III. The Category I routes which earlier were the metros and now form the busiest top 20 routes with distance over 700kms, annual traffic of 5 lakh passengers and seat factor of over 70% over one year (two consecutive schedules). As oil climbs back amidst volatile global environment, airline profitability in India could take a hit due to a very large percentage of operating cost of airlines comprising the Aviation turbine fuel (ATF). Increasing congestion at airports, high and uneven taxation on fuel is pinching airlines hard, an increase in airfare has the potential to further reduce the demand to remote locations in the country. An article by Vasuki Prasad arguing favorably for trading capacity between airlines reveals that all airlines put together fly 1.1% of the industry ASKs on Category IIA routes, with a mandate of 1% while 27.3% of industry capacity across all airlines is deployed on Category II routes when the mandate is 10%. This higher capacity comes from the need to fly to Category II station before deploying the aircraft on Category IIA route and most of the times offering a one stop connection from the metro city. Traditionally it is seen that there is lower premium demand on Category IIA and Category II routes which make the deployment difficult for Full Service Carriers. Kingfisher Airlines with its multiple sub fleets effectively used an all economy aircraft with higher seats (thus higher ASKs) on the routes to North East for higher Category II and IIA while the premium configuration did the metro runs. Low cost carriers are opening up new routes or find the remote routes sustainable due to lower Cost per Available Seat Kilometer (CASK). This lets them offer direct flights (Eg: IndiGo flies Chennai – Agartala nonstop) and go after large volume of traffic at yields lower than the full service carriers. Can there be an online platform where airlines can offer their excess ASK for trade and based on demand and supply the rates can be bid for? A point might come where an airline might develop a strong network and succeed with the support of others in underserved Category II and IIA routes. This might be a win-win for the airline, passengers, other airlines and the government. Having one flight a day to a station is not as economical as having multiple flights to a station when you map costs related to airport operations, staff, distribution and marketing. With two camps formed for allowing and not allowing the trading of ASKs, it must be noted that most if not all airlines have been involved in trading of ASKs or asking for some or the other exemption. The government, while devising the NCAP, came up with a Regional Connectivity Scheme (RCS) popularly known as UDAN (Ude Desh ka Aam Nagrik). The scheme aimed to operationalize unused airstrips across the country and help connect unserved airports and underserved routes. This is to be achieved by multiple sops from taxation to Viability Gap Funding and increasing affordability by capping the fares. There is uncanny resemblance between the objectives of UDAN and RDG – to provide connectivity to places which are under connected or unconnected and while UDAN routes get subsidy and benefits, the RDG have to be meticulously followed without any incentive to operate. With the broader objective of both RDG and UDAN being same – to provide connectivity to unconnected stations or underserved airports and regions, does UDAN make RDG obsolete? Should airlines operating routes under UDAN be allowed to use ASKs for category II or IIA? Scheduled Commuter Airlines like Air Deccan, Air Odisha and some of the yet to start ones like Star Air could find the routes even more lucrative if they get to sell their capacity to larger airlines and benefit further. This co-operation can translate into code-share or interline with seamless connectivity across the country. Next three years will give some clarity about the success of UDAN. This will also take us to the half way mark of UDAN scheme which will exist for ten years as per the policy. The next five years will require tweak in policy of RDG when the new airports at Navi Mumbai and Jewar are operational and it will be the first time that any city in India will have two fully operational airports. Starting with online platform for trading of ASKs to tweaking UDAN and RCS for eventual merger of both to form one scheme will be a win-win for the airlines, government and common passenger. 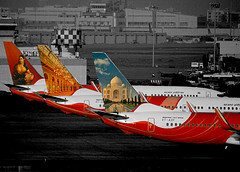 Civil Aviation in India is not used to planning ahead of time as can be seen from the infrastructure constraints. The NCAP was the first to define guidelines, introduce new schemes and have a definite path, is it time to plan ahead for once. Will a flight between Jewar and Navi Mumbai be considered a category I route? The question is not that far away! Very interesting post, Ameya Sir: and very valuble comments and ideas by someone who knows the Industry inside-out, as well as analyses it well. the selling of capacity by small regional airliners will make it attractive for larger players as well. I wonder how is it like in Japan for instance: buying a seats on a small route is prohibitively costly, but getting a code-shared one offers telescopic fares. It would be the same at many other places as well. Yes, it does benefit the customer as well, in addition to coming to use for smaller airlines. A minor hair-splitting point: Delhi had two functional airports at one point in time. `Tintin in Tibet' had Herge (Georges Remi) pay attention to this point!